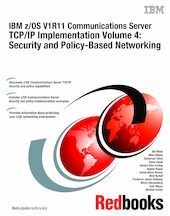 The IBM z/OS Communications Server TCP/IP Implementation series provides understandable, step-by-step guidance about how to enable the most commonly used and important functions of z/OS Communications Server TCP/IP. This IBM Redbooks® publication explains how to set up security for your z/OS networking environment. With the advent of TCP/IP and the Internet, network security requirements have become more stringent and complex. Because many transactions come from unknown users and from untrusted networks such as the Internet, careful attention must be given to host and user authentication, data privacy, data origin authentication, and data integrity. Also, because security technologies are complex and can be confusing, we include helpful tutorial information in the appendixes of this book. In addition, "z/OS Communications Server: IP Configuration Guide," SC31-8775, "z/OS Communications Server: IP Configuration Reference," SC31-8776, and "z/OS Communications Server: IP User's Guide and Commands," SC31-8780, contain comprehensive descriptions of the individual parameters for setting up and using the functions that we describe in this book. They also include step-by-step checklists and supporting examples. It is not the intent of this book to duplicate the information in those publications, but to complement them with practical implementation scenarios that might be useful in your environment. To determine at what level a specific function was introduced, refer to "z/OS Communications Server: New Function Summary," GC31-8771.